The three species of mesites and roatelos are approximately 12 inches (30 centimeters) in length. Mesites and roatelos are characterized by short, rounded wings, long, wide tails, and sturdy legs. Their bills curve downward, making it easier for them to forage, or hunt for food, on the forest floor. Mesites and roatelos are found exclusively on the large island of Madagascar, off the eastern coast of Africa. The brown mesite (also known as the brown roatelo) occupies forested areas in the eastern part of the island. 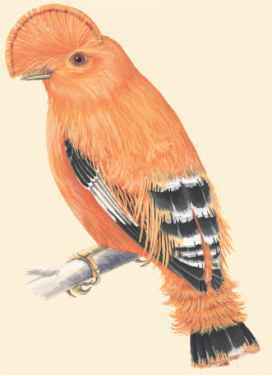 The white-breasted mesite (or white-breasted roatelo) is found in forests in the western and northern parts of the island. The subdesert mesite occupies a small area between the coast and hills in the southwestern potion of the island. Mesites and roatelos are found in distinct habitats on Madagascar. The brown mesite inhabits humid rainforests. The white-breasted mesite inhabits deciduous (leafy) forests. The subdesert mesite occupies open, spiny thicket habitats. The brown mesite and white-breasted mesite eat insects and other invertebrates, seeds, and small fruits from the leaf litter on the forest floor. The brown mesite and white-breasted mesite have bills that are adapted to lifting leaves without disturbing prey that may be hiding underneath. The subdesert mesite has a longer, more extensively curved bill that allows it to find invertebrates on the ground. Like the other mesite species, however, the subdesert mesite will sometimes feed in the leaf litter.